They are presumed to be extinct, but the biggest beasts that ever walked the earth return to the 21st century. Make sure you jump swiftly out of the way as with a deafening roar the Saurus charge through the crowds, looking for food. Breathe a sigh of relief as the Saurus start eating plant life. Ah vegetarians! Saurus is a larger-than-life spectacle combining theatre, stilts, music, fire, dance, metal constructions and aerial objects amongst the audience. Millfield Arts Centre and internationally acclaimed Performance Artist Mem Morrison are seeking individuals to participate in Silencer, an ongoing project, which is part of Circulate London, an Arts Council England funded project. Silencer will animate a landmark building in Enfield Town with a series of projected placards, revealing local people’s individual expressions about teenage depression. If you have suffered from teenage depression, know someone who is, whether it be a friend or family member, or you just have an opinion on the topic we want to hear from you! We want to get opinions and thoughts from all ages. Silencer is a deliberate act to create something outwardly positive and to encourage an exchange between differing opinions and views. This project will provide a platform which will enable you to have a voice and tell your story or the stories of your friends and loved ones. Our aim, is to raise awareness of an often-unspoken topic and to share our aspirations and optimism for a better future. To take part you will be required to attend a creative writing workshop led by Mem Morrison, the content created in the workshop will form the basis of the final installation. Your involvement can remain totally anonymous and trained support workers will be hand should you need them. And you? What are you looking at? Conseqüències is an ironic and joyful work on the possibility of being out of step, late, off the mark, and on the resulting consequences. Conseqüències is a humorous dance performance that explores the boundaries between reality and fiction. D-Construction is a very fun and energetic hip-hop dance performance with an infectious beat. In the middle of the space a huge and striking metal structure creates a playground, prison and place of expression. It protects and exposes. It holds and releases at the same time. It is a place of confrontation and inspiration. It connects, inspires and destroys to create something new. Come together in a fun, energetic event where you create a huge structure made out of wooden sticks. Once the hard work is done, you can explore your creation by walking under, around and through it! Steli is a stunning, interactive and colourful performance. A bridge between contemporary art and performance, Steli is open to everyone to take part. Fun, interactive games for the whole family that have delighted audiences at some 6,500 shows in streets and squares in 30 countries across the world! Created in Catalonia, the weird and wonderful kit for the games is made from everyday objects, recycled through sheer imagination to create this unique series of interactive treats. Hounslow residents - tell us what you think and get £20. The Bell Square programme wants to hear from local people about their views of Belly of the Whale. You need to be 16 or over, be happy to receive some information about the show in advance, able to watch the performance at 3pm on 8 September and then come to an informal discussion group at Hounslow Arts Centre the next day at 3pm. Expenses of £20 each available for everyone who watches the show and comes to the discussion. If you would like to take part contact sarah@sarahboilingassociates for more details. Circulate Resident Artists Ockham’s Razor present their exciting first show made specifically for outdoors. Ockham’s Razor are supported by Arts Council England. Belly of the Whale is commissioned by Without Walls, Stockton International Riverside Festival, Greenwich + Docklands International Festival, Out There International Festival of Circus & Street Arts, Norfolk & Norwich Festival, Salisbury International Arts Festival, Circulate and Stratford Circus Arts Centre. Liberty Unbound, the Mayor's disability arts festival, has an exciting new twist for 2018. Instead of one big event, we're bringing Liberty Unbound to you. Enfield, Hounslow and Deptford will host 3 fantastic free performances at local venues. A vibrant programme of music, theatre, art and dance will celebrate diversity in the creative arts, making sure that everyone can enjoy the action! Graeae, the UK’s leading Deaf and disability theatre company, will stage its classic adaptation of ‘The Iron Man’ by Ted Hughes, featuring a puppet as tall as a double decker bus. Ted Hughes' famous children's story is adapted by Paul Sirett and directed by Amit Sharma. Candoco, a company of disabled and non-disabled dancers, will perform ‘Dedicated To...’. Caroline Bowditch's moving new duet celebrates female strength, friendships and support, exploring how people come in and out of our lives and how friendships shape who we are. Deaf Rave, founded by Troi Lee in 2003 as a quarterly event in London for deaf clubbers, will present several DJ sets, creating a kaleidoscope of sound for all to enjoy! There will be regular shuttle buses to and from Liberty Unbound sites. Liberty Unbound offers BSL Interpreters, an Induction Loop and Audio description equipment for performances and workshops, and roaming personal assistants will be available to offer additional support. There will be Blue Badge parking available on a ‘first come first served’ basis for the duration of Liberty Unbound. Saturday September 1st at The Treaty Centre Car Park, TW3 3NT - please quote ‘Liberty Unbound’ at the Car Park and speak to a steward at Liberty Unbound for more information. Liberty Unbound is organised by the Mayor of London, produced by Circulate London, and curated by Greenwich + Docklands Festival. A circus show ankle-deep in water? Why not! Two clowns step into the spotlight in this unusual show where a Chinese Pole becomes a flute, water turns into a drum, a guitar and banjo fearlessly face down whirlpools, and the stage...is filled with water. Île O will leave little ones and their parents in fits of laughter. Lance Moi En l'Air is about the sensitivity and connection between two people which brings about compatible contradictions. Can we be strong whilst relaxed? Heavy whilst light, grounded whilst levitated, submissive whilst in control, a mixture of strength and weakness? Can we be dropped into the air? Humanity emerges and acrobatic prowess speaks between bodies. In a mixture of abandonment and accountability this piece is sensitive, where bodies just fit together. Using their trademark mix of digital projections, live painting and performance, Insectotropics presents The Legend of the Burning Man, which tells the story of Mohammed Bouazizi, who sparked the Arab Spring when he set himself on fire in protest at the authorities in Tunisia. The show examines the spread of news across the internet, how social media offers partial and self-interested perspectives, and how public opinion and feelings are manipulated. Who controls what we believe? The Legend of the Burning Man is a poetic journey, based on real events, created to answer a big question of our time: If we are all on the web, who is the spider? Rock gently, turn slowly, listen to the alphabet... Bang the drum, rattle the chain, rock the boat... File your Forecast for the Future. 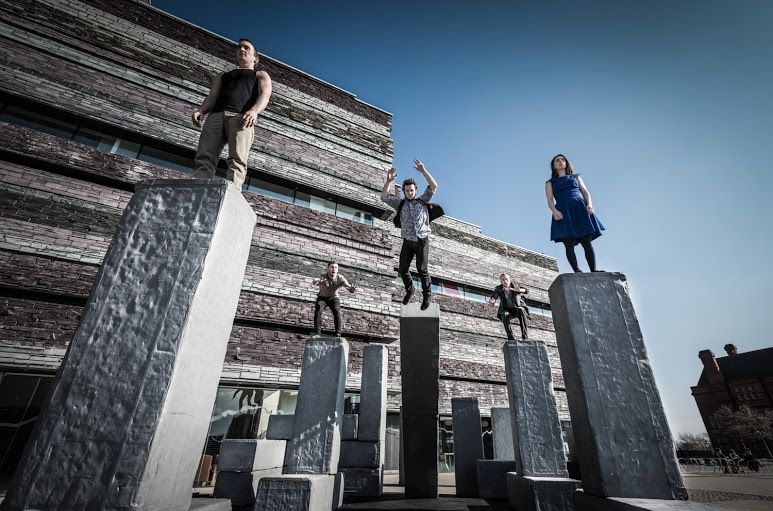 Twenty over-sized blocks are deconstructed and reformed into an infinite variety of shapes for the performers to play on, move with and explore. BLOCK is about life in the city; its contradictions and challenges.